Home » apps , books , ipad , iphone , ipod , weird al yankovic , when i grow up » "Weird Al" Yankovic's book WHEN I GROW UP now an awesome app for your iOS gadget! "Weird Al" Yankovic's book WHEN I GROW UP now an awesome app for your iOS gadget! 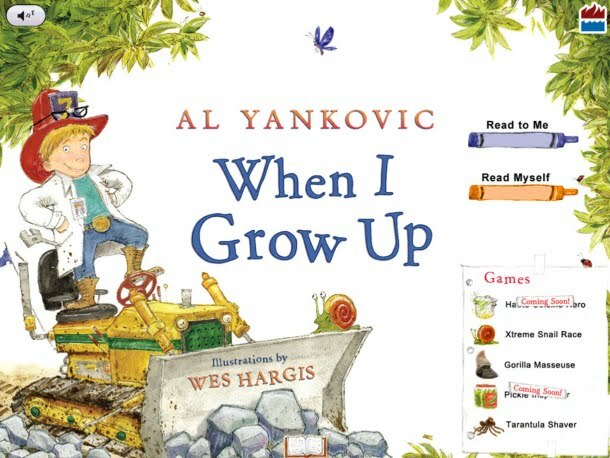 This past winter master musical parody artist "Weird" Al Yankovic published his first-ever book, When I Grow Up. Yankovic's children's book resonated with audiences of all ages and fast found itself on the bestseller lists. If you've read it (and even if you haven't yet, you hooligan!) and you happen to have an iOS gizmo like an iPad or an iPhone, you'll be sure to want to check out the When I Grow Up interactive book on Apple's App Store. The entire book with all its artwork is here, along with at least 27 (quite possibly many more) hidden surprises, all accompanied by Yankovic's voice! There are also a few mini-games that will have you honking with laughter. Not kidding: "Gorilla Masseuse" for a few days recently was the most-played game on my iPad! I think it took me the better part of the week to keep that poor ape from going on a GORILLA RAMPAGE!